I wanna know how a goose got in your tub. Please. Basically it's all Eshe's fault. We (Ashton, Eshe, Kimbelle and I) were at Joe's Crab Shack. After dinner we were sitting around teasing, I mean talking. Eshe went out for a cigarette. When we all left, there were a bunch of people crowded around the front of the building. I get out there and there is this goose. It is literally up against Eshe and folks are petting it and taking pictures. I see that it has a broken wing. I go into Bird Commando mode and herd it into Eshe even more. Then I loosely grasp the neck and hoist the bird up under my arm. You'd think I'd done this before. I've never picked up a water fowl in my life. So the kids all have to pet and we discuss how to pet and why it has "teeth things". Yes, Arwen the intrepid wildlife educator. I proudly announce to one and all that it is a NeNe goose. Then I ask Eshe to grab my keys and purse and food. Eshe, being one smart butch, realizes that he is going to have to help me so he gallantly escorts me and goose to my Blazer. Goose is not happy about sitting in my lap. So goose struggles until goose is on the floor. This is after goose has christened my cute dress. So we take off and goose sticks its head UNDER my dress. Eshe pretends to be looking out the window while choking. I am sure that he was not howling with laughter at the fact I now have a goose under my skirt. The goose is tasting my inner thigh. I let out a somewhat demure yelp (Okay, I may have screamed out the open window that there was a goose under my skirt) and we drove on. Goose and I and Eshe arrived at my apartment where I put goose in the tub and ran water. Goose is very very very very tame. As in likes to be petting and doesn't even begin to try to flee. So I look up all sorts of information. The first thing I discover is that it is not a NeNe but a Chinese Swan Goose (brown variety). She is female. I determined this from reading two web pages. I are so smart. I'm calling her Josephine and wishing I could keep her. So, you can see how this is all Eshe's fault. I do think Eshe may realize that now. nice of you to help the goose! were you able to locate a wildlife rehabilitator in your area? contacting DNR for your county/state may be able to help you, if you have not found someone already, to take the goose. ETA: i love research. so, i'm submitting these resources, even if you have found a WR, the links may be of help to someone in the future. Keep the animal warm, safely contained, and away from loud noises, children, pets, and air conditioning. DO NOT FEED THE ANIMAL FOOD, WATER, OR MILK until you have spoken with a permitted wildlife rehabilitator. Water can go into the animal's lungs and cause pneumonia. Feeding an animal the wrong food will cause more harm than good. Most native wildlife are protected by state and federal laws. It is illegal to possess the animal or its nests, bones, feathers, or eggs without the proper permits. Wild animals belong in the wild—they are not pets. Last edited by violaine; 06-21-2010 at 01:13 AM. "She wouldn’t even say hello to you," said Lynda White, Eagle Watch coordinator for the Audubon Center for Birds of Prey in Maitland. "She’d take the bird and kiss it on top of the head." i respected & loved her; she taught me a lot of lessons years ago. may she fly free as a bird, and with the birds, gather to communicate, perch on sound-filled limbs, and soar effortlessly over lush fields..
OMG Thank you for posting this! They ran a piece about the eagle cam on NPR this afternoon! [QUOTE=Miss Scarlett;314512] ...they're feeding the babies!!!! i keep checking on them she's a good mama bird. was asleep, now cleaning her feathers. love the infared light. Crows are way cool! Great pic Daywalker! the following links involve some lives of workers involved in the oil spill cleanup. i passed all of the examinations required to go there- and checked in frequently with NWRA/Audubon, elsewhere, because of a desire [calling] to help these birds. though it was not until close to the time for me to start packing things up in indiana to move back home, did i receive a call from the audubon society about going down to help. i knew that by my being on the autism spectrum with metabolic issues/chemical sensitivities, and so on, my plan to help, perhaps, not the most well-made/wisest choice; and now, one year later, i see how so many individuals are, not surprisingly, very ill from the chemicals involved in this cleanup effort. Last edited by violaine; 04-20-2011 at 01:00 PM. After being involved in some of the clean-up efforts around the SF Bay after the tanker spill a few years ago, I have been keeping track of shore birds at the dog park I walk my pooch at daily. The park is right on the Bay and you can go off on other trails in protected areas (but not with dogs off leash). For a long time, the birds left because the oil obviously ruined their food supply. Now, they are returning- it has taken nearly a decade! Sometimes, I bring a snack and after my dog has had some good exercise, I sit with my "nocks" and just watch them feeding at low tide. The numbers have increased from last year to this! Frog Dog just sits next to me and looks out at them. I talk to people that allow their dogs out in that area- tell them it ain't cool! Although, very few people do this. This park has co-existed with the bird sanctuaries established for over 20 years and now there is a fight going on to take away portions of the dog park. The birds are returning and they don't seem to have any problems with the dog park being nearby as long as humans read and observe the rules! Also, all of the rest of the shoreline is totally restricted- no dogs at all for many miles. they need these areas to produce little baby birds and dogs would disturb this process. I wish people would just stop screwing up things! Observe the rules and everyone, including our pooches can enjoy this wonderful park. 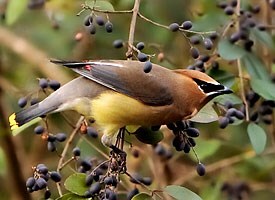 I have a family of these at my bird feeder this morning. The parents are still feeding the baby but trying to entice it into eating from the feeder on its own. The baby would rather sit on top of the feeder fluttering wings with beak gaping. 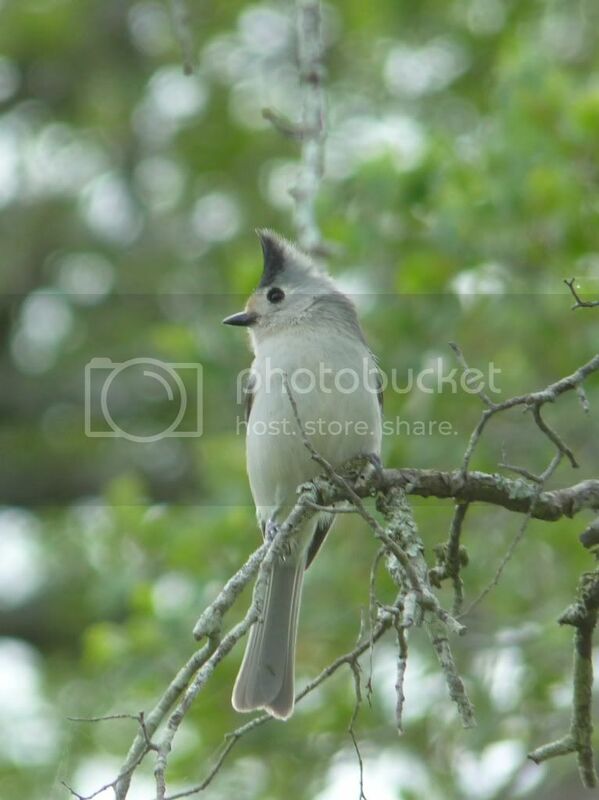 They are Black-crested Titmouses (Titmice?) and they are bringing me such joy this morning. And I'm very sad about the Eagles in Iowa. Apparently the female had a fatal encounter with a plane. The last time I went to the site, the camera was offline as well. But back to joy! My bird feeder routinely sees the Titmouse family and doves. I've seen a male cardinal eyeing it but haven't seen him enjoying it yet. I am going to get a tube feeder so I can put out some oiled sunflower for he and his family. look how far below the traffic! The Moa stood thirteen feet high, and could step over an ordinary man's head or kick his hat off; and his head, too, for that matter. He said it was wingless, but a swift runner. The natives used to ride it. It could make forty miles an hour, and keep it up for four hundred miles and come out reasonably fresh. It was still in existence when the railway was introduced into New Zealand; still in existence, and carrying the mails. The railroad began with the same schedule it has now: two expresses a week-time, twenty miles an hour. The company exterminated the moa to get the mails. Oh, this is such a beautiful bird!...We love birdwatching!.....I was told about this thread the other day, but I never saw it....I couldn't find it.....So, thank you for whomever added to the thread.....Now, my honey and I can enjoy the birds too!